Harm reduction is now a widely recognised aim The slavish adherence to the goal of smoking cessation has been superseded by a more pragmatic focus on reducing the harm associated with smoking cigarettes. This reflects the fact that a large element of smokers cannot, or will not, quit completely. The shift in emphasis also follows the benefits seen from the widespread uptake of alternative nicotine delivery systems, notably e-vapour devices. Voke is well positioned in this emerging environment Voke is designed to deliver nicotine in an analogous manner to a cigarette. It provides rapid craving relief and closely replicates the behavioural and psychological aspects of smoking. Voke contains no tobacco, and doesn’t involve combustion, heat, or electronics. It delivers a precise amount of nicotine using a proprietary technology similar to an asthma inhaler and is approved as a medical device. Commercialisation is the next stage Around £120m has been spent to date on Voke’s development. The manufacturing capabilities are now largely in place, extensive test marketing has been performed, and the UK distribution channels have been established. Management’s next challenge is to fund and execute the commercialisation plans. DCF model suggests a valuation of £154m We value Kind Consumer using a rDCF model based on revenues from the UK market only, which generates a value of £154m. We have employed conservative assumptions throughout, leaving significant upside if any of the key forecast variables are exceeded. Kind Consumer was founded in 2006 by Alex Hearn, an Oxford classics graduate with a passion for technology and innovation. His ideas led to the Voke device, which was developed with the help of several high-profile investors. Voke is a miniaturised breath-activated inhaler that delivers nicotine directly to the lungs in a manner analogous to a cigarette, mimicking the social rituals of cigarette smoking but with notably fewer harmful effects. In 2010 Nicoventures, a division of BAT, acquired the worldwide rights and spent c £120m establishing the manufacture and supply chain. Voke was approved as a medical device by the UK’s MHRA for General Sale in 2014. In 2015 Nicoventures failed a Process Qualification exercise just ahead of the UK launch. In January 2017 Kind Consumer was able to take back all rights to Voke. The strategy is to launch Voke directly in the UK, where it will be made available through retail outlets just like cigarettes, as well as pharmacies, and seek partners for other markets. Valuing any pre-revenue company is not straightforward, irrespective of the novelty, quality, and attractiveness of its technology platform. Typically for drug development and medical device companies we use an rNPV or DCF model to ascribe value to each development project, generating a detailed revenue and cost forecast, which are then netted against known central costs and net cash. The approach works well with Kind Consumer and results in a valuation of £154m. We note that, in line with our philosophy, we employ conservative assumptions throughout; for instance, we consider only revenues from the UK. Interestingly, the execution risks are the largest near-term factors; were we to remove these the valuation immediately rises to £268m, again for UK only. Kind Consumer is funded with a cash position of £4.7m on September 2017 and we understand has a cash burn of only £3.3m. However, this excludes the costs of manufacturing scale up and UK launch activities, which we believe will require c £35m in additional funding. Our forecasts would suggest £12m to £15m is required to complete the manufacture set-up and production batch validations, with a further up to £18m to prepare and launch Voke into the UK market, including the need for additional working capital. The typical life sciences industry risks of clinical trial failure, regulatory hurdles, and ensuring appropriate pricing do not apply to Kind Consumer. The evolving landscape for cigarette alternatives means the regulatory, competitive, and fiscal environments are benign or supportive. The main sensitivities for the investment case now relate to the successful execution of the commercial plans in the UK, particularly ensuring consistent quality of manufacture and maximising consumer adoption. An early success would aid the sourcing of suitable partner(s) and/or funds to roll-out Voke into other key geographies. Kind Consumer is poised to commercialise Voke, its innovative and unique nicotine delivery device, into the most receptive market environment for several generations. A confluence of three major trends are set to transform the industry dynamics: public health and regulatory bodies are shifting from focussing on “quit smoking” to “harm reduction”; a sizeable consumer demographic is increasingly amenable to new approaches (helped in no small part by e-vapour devices); and “big tobacco” is moving emphatically away from cigarettes towards novel nicotine products (notably “heat-not-burn”). Even a modest adoption for Voke in the UK alone would result in sizeable revenues, successful internationalisation would obviously result in material uplifts. Our risk-adjusted DCF model results in an initial valuation of £154m. The dangers of smoking cigarettes have been well communicated and yet the WHO predicts there will be over 1.1bn smokers globally by 2030. The harsh reality is that complete abstinence from smoking is difficult to achieve and there is growing support for harm reduction initiatives. Increasingly guidelines advocate the use of nicotine-containing products to help people maintain a quit attempt, reduce their level of smoking, or to use indefinitely. This changing public health emphasis, coupled with the greater availability of novel nicotine delivery systems, has seen sizeable sales of devices such as e-cigarettes and the rapid uptake of “heat-not-burn” tobacco products in several test markets. Voke is a novel nicotine delivery device that addresses the key behavioural aspects of the smoking rituals, with rapid nicotine delivery and respiratory tract sensory cues. Extensive consumer testing has shown it to be highly effective in craving reduction and suggests ready adoption across a broad range of smoker demographics. The inhaler stick is similar in size and shape to a cigarette and each charge gives a comparable number of puffs. The stick can be refilled around 20 times via a pressurised canister of nicotine, which is an integral part of its storage container, which is similar in size to a pack of 20 cigarettes. Kind Consumer, together with its previous partner Nicovations (a wholly owned subsidiary of BAT), has spent over a decade and c £120m developing the Voke device to the point where it is ready for market. The commercialisation strategy has been honed following extensive consumer test marketing and the validation of the manufacturing processes to support a launch is nearing fruition. The strategy is to initially launch Voke in the UK, where the distribution channels are primed and open, and to use the lessons to drive partnering discussions for other geographies. The sheer magnitude of the smoking market means the revenue potential is significant and even only a modest consumer uptake would result in sizeable sales. Later in this note we detail our valuation process and, despite looking only at the UK and adopting our usual conservative approach, we reach a value of £154m. Tobacco smoking remains the single greatest cause of preventable illness and early death. Extensive, and expensive, efforts by political and medical bodies over the past 40 years have reduced the global prevalence of smoking materially; but recent trends suggest a clear levelling in the rate of decline. In 2016 20.2% of the adults in the world smoked a total of 5.5bn cigarettes to a value of $683bn (representing a value increase of 1.4%). Cigarette volumes dropped by only 1.3%, the lowest rate of decline since 2012, as demand in Eastern Europe and Middle East & Africa partly offset the continuing falls in Asia (notably China), the Americas, and Western Europe. In the UK, smoking prevalence has fallen from 45.8% of adults in 1974 to 16.9% in July 2017; however, this masks large variations across demographics and age groups. For instance, prevalence among the socio-economic groups A-C1 (professional to clerical) is 11.7%, whilst within C2-E (manual occupations) it is double at 23.3%. Prevalence is also highest among the young, with those aged 20–24 and 25–34 being 28% and 26% respectively, compared to 11% for those 60 and over. Smoking is particularly prevalent in socially deprived areas and among groups such as those with mental health problems, people in prison, and the homeless. NICE reports that two-thirds of smokers say they would like to stop and three-quarters of these have tried to do so in the past year. It is estimated2 that of the 7m smokers in the UK, c 30% are consonant (content to smoke knowing and accepting the risks) and c 70% are dissonant to some degree. For this majority, the options are: to quit smoking (the ideal solution); reduce smoking; switch to safer products; or do nothing. In the last year 34.4% of smokers attempted to quit, but only 6.8% succeeded without relapsing. Despite laudable efforts to encourage quitting, more pragmatic public health guidelines now recognise that reducing cigarette consumption is just as important a way to achieving the desired harm reduction. This is especially pertinent for those smokers whose nicotine cravings lead them to inhale more deeply and smoke more of the cigarette (typically the C2-E group). The harm associated with cigarette smoking is almost entirely caused by the toxins and carcinogens found in tobacco smoke – not the nicotine2. A typical cigarette burns at around 800 C and produces smoke with more than 7,000 constituents, of which over 60 are known carcinogens (including benzopyrene, nitrosamines, and benzene). The annual burden of treating smoking-related illnesses is significant, with the direct NHS cost estimated at between £3.2bn and £6.2bn and the overall cost to the UK society at c £14bn. For context, HMRC receives around £9.5bn in duties and £2.5bn in VAT per annum from tobacco. The pace of change is accelerating as the cigarette industry embraces novel nicotine delivery devices that offer the prospect of credible harm reduction claims. Euromonitor data shows that last year the cigarette category dropped to 89.8% of total global sales and expects this to fall to 86% by 2021, a sizeable shift as it took more than 15 years for the equivalent decline (from 93% to 90%) to happen. This is attributed to continued growth in vapour products and, notably, the emergence of heated tobacco (also known as heat-not-burn) as a viable alternative means of nicotine consumption. In 2016, novel nicotine products as a whole grew at 34% in constant currency terms to $12.3bn. e-cigarette products, as both closed and open systems, accounted for $10.2bn, with heated tobacco (largely accounted for by Japan) representing $2.1bn. Euromonitor expects the whole category to grow to $34bn by 2021, with e-cigarettes rising strongly to $18.7bn but heated tobacco products booming to $15.4bn. This contrasts with the forecast 1% value decline in cigarette sales over the same period, equivalent to an increment of $7.7bn. Exhibit 1 shows the share breakdowns and highlights how the forecast $13.2bn incremental sales from heated tobacco products will more than offset the $7.7bn cigarette decline. Euromonitor expect the heated tobacco category will have a solid presence in at least 35 countries by 2021 and, although no other market will achieve the 22% share forecast for Japan, the global share (ex China) is expected to be 3.5%. It is this widespread adoption of heated tobacco products that should halt the long-standing decline in tobacco sales and result in a c1% value growth for the overall global nicotine market. Other commentators are even more positive, with many forecasting the new devices could capture up to 30% share of cigarette market in Western countries within a decade, with the consequent financial benefit for the tobacco majors. Voke is well positioned for this emerging marketplace: it is odourless, discreet, issues no “smoke”, and delivers nicotine rapidly to the brain to provide craving relief. Being a regulated medical product allows it to be advertised in the same manner as NRT (Nicotine Replacement Therapy) products yet, in the UK, it can be sold not only through pharmacies but across all the retail outlets that would traditionally sell cigarettes. Voke is a novel nicotine inhaler device that is the same size, shape, and weight of a conventional cigarette. It comprises a small, breath-operated valve that allows users to closely regulate their nicotine intake. Its mode of action is deliberately designed to intuitively emulate the behavioural and psychological aspects of the rituals of smoking. Each charge of the device gives a comparable number of puffs to a conventional tobacco cigarette. It can be refilled approximately 20 times via a pressurised canister of nicotine, which is an integral part of its storage container, similar in size to a pack of 20 cigarettes. The Voke device consists of two parts: a pressurised aluminium canister containing the nicotine formulation housed within a simple plastic pack; and the removable stick inhaler, which is also housed in the pack. The stick delivers an aerosol of nicotine via the breath-operated valve for buccal inhalation. Voke doesn’t contain any tobacco; nor does it involve combustion, electronics or heat of any kind in its use. The propellant, HFA-based, is widely used in asthma and other similar medical inhalers and Generally Recognised As Safe (GRAS). The valve is designed to actuate at low inhalation flow rates comparable to those of cigarette smoking. The characteristics of the resulting fine particles means that around 90% of the nicotine is delivered into the lungs, where the rapid absorption closely parallels that seen with a cigarette. The speed of onset results in nicotine craving relief analogous to traditional smoking. It is this speed of onset, coupled with the delivery of a clinically relevant nicotine dose, that is important for smokers who are struggling to wean themselves off cigarettes. The stick inhaler allows a similar titration of the total nicotine dose that smokers do intuitively through the frequency and depth of inhalation. Importantly, this allows Voke to deliver a high craving relief with a low total nicotine dose. The behavioural aspects of using the Voke system also closely follow the various aspects of the smoking ritual, with similar haptic and sensory cues. The only material difference is that the inhaled mist is perceived as cool within the respiratory tract (whereas tobacco, both smoked and heated, and e-vapours are perceived as warm), but extensive consumer testing doesn’t view this as an issue and confirms the attractions of the device. Voke is approved by the MHRA (Medicines and Healthcare Products Regulatory Agency) in the UK as an alternative to smoking as Voke/Nicotine 0.45mg Inhalers. The complete inhaler system is regulated as a Medicinal Product according to Directive 2001/83/EC, with the stick registered as a Class IIa medical device according to the Medical Device Directive 93/42/EEC. The licence allows for its purchase, without a prescription or the supervision of a pharmacist, at “pharmacies, supermarkets, and other retail outlets”. 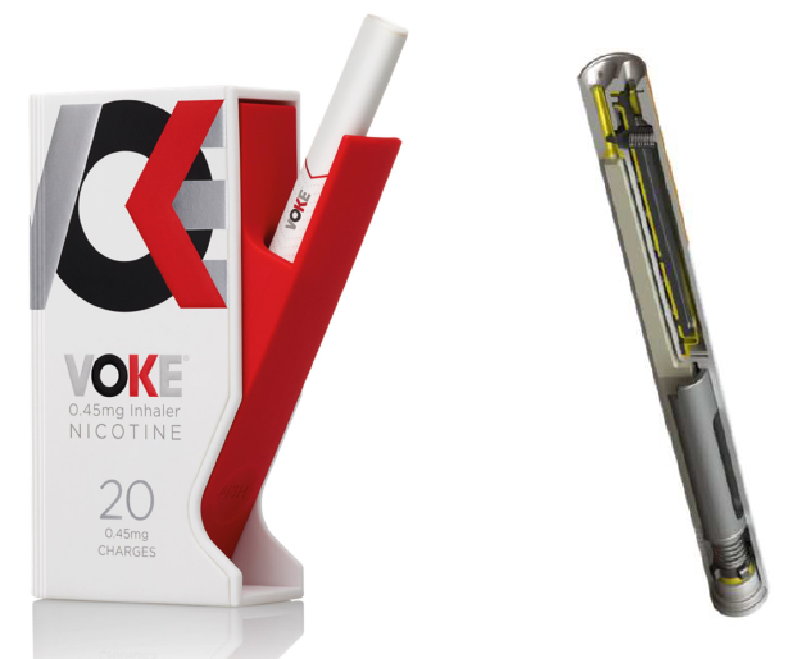 Whilst the public health environment has clearly shifted towards encouraging harm reduction, the commercial opportunity for Voke has also been created by the widespread adoption of non-tobacco alternatives, such as e-vapour devices, and by the introduction by the tobacco majors of “heat-not-burn” platforms, such as iQOS (Philip Morris) and glo (BAT). Although Philip Morris may have been the first to market, BAT have moved commendably swiftly to capitalise on the opportunities and their glo device is expected to gain significant share. e-vapour devices have come a long way since they first appeared in China in 2003. The product category is now very diverse, and awareness and use has grown rapidly. Although there are numerous types of device basically they all vaporize a liquid containing a humectant, commonly propylene glycol and glycerin in a 70%/30% mixture, together with nicotine, flavours and other additives. In “closed” systems the liquid is typically contained in dedicated disposable cartridges, whilst “open” systems tend to have refillable reservoirs or tanks (topped up with nicotine liquid). When users draw on the mouthpiece, or press a button on most tank models, the heating element is activated, vaporizing the humectant into a very fine mist that can be inhaled. e-vapour uptake really took off around seven years ago as it moved from early adopters and more into the mainstream, but recent statistics suggest that prevalence has remained stable at c 5% since late-2013 (STS July 2017). Initially it was the closed systems that gained traction but, driven by factors such as the low amount of nicotine delivered and high relative cost, the open systems have become more popular. As consumer penetration increased, the vaping industry has sought to differentiate itself from tobacco cigarettes; with the modern devices being very different in terms of size, weight, and user experience from a traditional cigarette. The e-vapour market remains highly fragmented, with over 50 companies known to be active and servicing an increasingly diverse user base. Approximately two-thirds of e-users also continue to smoke cigarettes, using the device either when smoking is not possible or to actively reduce cigarette consumption. Interestingly, e-devices are now the most popular aid in attempts to quit smoking (39.5% vs 26.4% for Nicotine Replacement Therapy). A number of concerns have dogged e-devices, but most appear to be unfounded. Although the vapour created by e-devices can be potentially harmful, the inhaled mist is thought to be at least 20 times safer than tobacco smoke. Initial fears that e-cigarettes could prove to be a gateway into smoking have not materialised and usage by non-smokers is rare. The most common reason given for using e-cigarettes is to reduce health risks of smoking (by helping to stop smoking completely or reducing smoking). However, the nature of vapour generated means that the nicotine absorption is not ideal. The very small particle sizes result in relatively low deposition within the lungs, with most being expelled on exhalation. In many devices most of the nicotine is absorbed through the mouth and throat, which leads to continuing nicotine cravings. This is particularly notable in the low initial nicotine delivery, resulting in a poor “hit”. A consequence is that e-vapours seem to be associated with a higher total nicotine intake and the use of stronger nicotine liquids (especially among more frequent users) as compensatory mechanisms. Heat-not-burn products have the potential to revitalise the economics for the tobacco industry, with Philip Morris talking positively of a “smoke-free future” and the “phasing out of conventional cigarettes”. Certainly, the industry majors have invested heavily in a variety of novel nicotine delivery platforms (Exhibit 3 shows Philip Morris’ iQOS and BAT’s glo). The aim is to develop a range of products that can be scientifically substantiated to reduce risks and are acceptable substitutes for smokers who can’t or aren’t willing to quit. Such goals are not new and previous efforts at “safer cigarettes” by companies such Philip Morris and R.J. Reynolds were notorious failures. Partly this was because, much like most nicotine replacement products (such as patches and gums), the nicotine was released either too slowly or in insufficient levels to satisfy cravings. Also, they lacked the key behavioural rituals that play such a critical role in addressing smokers’ overall needs. This time, however, it does appear to be different as the market is more receptive to the key messages; with the new delivery devices continuing to gain momentum and now having meaningful traction among consumers. In fairness, the e-vapour devices have blazed a useful trail for such novel devices, which the tobacco majors have been adept at exploiting. Despite some vociferous criticism, for instance “Smoke by any other name” (JAMA 2017), it is becoming clear that these novel devices are tapping into a rich harm reduction vein; which, if sustained, would result in disruptive changes to the industry dynamics. Interestingly, industry commentators are increasingly talking of “when”, and no longer “if”, these novel devices become mainstream products. Philip Morris first introduced iQOS in Japan in 2015, where it holds c 13% share, and it has been rolled out to over 25 geographies, such as Turkey, Italy and Romania. iQOS consists of three components; a slim pocket-size charger, an electrically powered heating element, and a disposable short stick (typically half the size of a cigarette) containing tobacco and other ingredients. The stick is heated by an inserted blade to a point below combustion (around 350 C) to produce an aerosol-like vapour that has about same amount of nicotine and similar delivery characteristics as a cigarette. BAT introduced glo, its heat-not-burn product, in Japan, Switzerland and Canada in 2016. The concept is similar to iQOS but the execution differs in several minor, yet important, details. Philip Morris deliberately made their inhalator a slim pen-shape to better mimic the weight and feel of a cigarette. A downside of the elegant size is a restricted battery life and so limiting consumption to single sticks with an enforced wait as the pen battery is recharged (circa ten minutes). In contrast, glo is a single box-shaped unit that allows for a larger battery and so eases consumption of multiple sticks (a fully charged glo can power around 30 sticks, similar to the iQOS base unit). The glo device also heats the sticks to a lower temperature (around 240 C) but whether this conveys health or taste benefits is not yet known. In Japan glo is currently 20% cheaper than iQOS, but that differential may not be maintained in other markets. The Japanese market is interesting since it will allow head-to-head comparisons of the two products. However, the domestic idiosyncrasies, coupled with the notable affinities of the local consumers for state-of-the-art and high-tech products, means that the experiences seen there may not translate fully into other geographies. The need for more appealing nicotine products to help reduce the prevalence of smoking has been recognised, and recent published guidelines advocate the long-term use of licensed nicotine-containing products to help people maintain a quit attempt or reduce their level of smoking, or to use indefinitely as a method of harm reduction. Voke is licensed for use in the UK to relieve and/or prevent craving and nicotine withdrawal symptoms associated with tobacco dependence. It is indicated to aid smokers wishing to quit or reduce prior to quitting, to assist smokers who are unwilling or unable to smoke, and as a safer alternative to smoking for smokers and those around them. The MHRA would act as the reference member for the Mutual Recognition Procedure (MRP) across Europe. Approval should be relatively straight forward, however the marketing of such products could vary significantly across countries. For instance, Voke could be sold across all channels in Sweden where it would be considered a GSL (General Sales List) product; whereas in France and Germany it would be available only through pharmacies and the harm reduction indication would currently not be recognised. Other countries, such as Ireland, would approve as a pharmacy-only product (like other NRT) but would look favourably on an application for reclassification. In the US there would be two possible approaches for regulation: as a medicine through the FDA’s CDER (Center for Drug Evaluation and Research) or as a tobacco product through the FDA’s Center for Tobacco Products (CTP). Whilst being approved as a medical product would carry a certain cachet, the clinical data required could be material (and it would likely not permit a direct to OTC label). In Canada the MHRA licence would be helpful in gaining approval under the Natural Products Directive; however, the harm reduction claim would be unlikely to be recognised. Voke has been submitted in New Zealand, where all outstanding questions have been addressed and a positive outcome expected, and Australia, where major issues remain and additional studies may be needed. Japan remains an enigma. The difficulties in gaining recognition for e-vapour devices contrasts with the ready acceptance of heat-not-burn products. It is clear that navigating the regulatory pathways for Voke will require a well-established local partner, but local clinical data is likely to be needed. Voke was previously licensed to Nicovations, a wholly-owned subsidiary of BAT. As part of the terms there was a predetermined timeframe following the MHRA approval for Voke to be launched. An issue with a key manufacturing process qualification in mid-2015 resulted in the window being missed and allowed Kind Consumer to regain ownership of Voke in January 2017. In fairness, BAT has behaved admirably throughout the process and allowed Kind Consumer to access all the relevant regulatory documentation and pre-launch materials. Similarly, the bespoke production equipment has been leased, at an attractive rate, for 15 years with an option for outright purchase. The outcome suited both parties as BAT was uncomfortable dealing with a medically regulated product and creating new non-tobacco distribution channels, whilst the focus on e-vapour and heat-not-burn platforms had begun to bear fruit. The manufacturing issues have been addressed and the equipment has been re-sited to a dedicated suite at a new contract facility in Ireland. We estimate that around £15m in additional funding is required to complete the validation of the production processes and prepare for the initial launch in the UK. Novel nicotine devices are still in the nascent stage as a category and many questions remain unanswered or, more realistically, are even possibly currently unknown. Nonetheless, it is clear the environment is the most receptive, across multiple fronts, that it has ever been. After laudable and sustained efforts to engender the quitting of cigarette smoking, the medical, regulatory, and consumer environments are embracing harm reduction as a worthwhile goal. Dominated by industry majors Whilst the e-cigarette segment has shown how relatively small players can disrupt a market and gain significant share, it should be noted that the most recent product introductions have been by major tobacco players. These have the resources, determination, and capacity to disrupt the commercialisation plans of competitive products. Equally though, they have also demonstrated their willingness to acquire any worthwhile new market entrant or technology platform. Regulatory environment is uncertain Uniquely, Voke is approved as a medical device in the UK, which will facilitate its approval in Europe and other geographies. However, the likely status in other key markets is currently unclear, as is the cost to gain the regulatory path to market. Recent debate about the risks of nicotine addiction may result in incentives and/or penalties to lower nicotine doses. It is worth noting that Voke’s pharmaco-kinetics means it achieves craving relief for a relatively low overall dose. Distribution and marketing The plan is to self-market in the UK and, using the expertise gained, to out-license for other geographies. Whilst the pre-launch activities performed by BAT are invaluable and the distribution channels have been identified and primed, inevitable unknowns regarding consumer adoption and sales traction will remain throughout the launch. Intellectual property protection Voke has a multi-layer IP strategy, having filed numerous patents covering the platform, device, components, and technology (some in the process of being granted). Nonetheless, as is common in this field, litigation risk remains an ever-present sensitivity. Funding to the next key inflection point The support of respected existing shareholders is reassuring; however, Kind Consumer requires sufficient funding to complete the production validation and launch Voke in the UK. These risks, whilst tangible, are in our view containable. Importantly, once the funds to progress its UK commercialisation strategy are in place, it should be able to demonstrate Voke’s sales potential in other geographies. This in turn should lead to licensing opportunities, an IPO, or even an outright acquisition. Valuing any pre-revenue company is not straightforward, irrespective of the novelty, quality, and attractiveness of its technology platform. Typically, we would employ a rNPV model to ascribe a risk-adjusted value to the various elements of the company’s portfolio, discounting these back and making the necessary adjustments for costs, tax and net cash, without the inclusion of a terminal value. However, given that Voke is a consumer health product and, since we expect it will become a valuable brand with a lifecycle beyond its patent expiries, we believe it is more appropriate to use a rDCF model with an appropriate terminal value. Using this methodology, we value Kind Consumer at £154m based on UK sales only and with other conservative assumptions as detailed in Exhibit 4. It is notoriously difficult to predict the rate of adoption of a novel product such as Voke, hence we do not expect our peak UK sales estimate of £186m to be reached until FY26, although this could be achieved more quickly, especially if the marketing of Voke goes viral. Similarly, we have only included potential sales from the UK, even though Kind Consumer could generate a multiple of these revenues if (or when) Voke becomes an international product (as expected). We believe it is also prudent to include a risk-adjustment to account for other uncertainties including those associated with manufacturing and launching such an innovative product. We have also carried out a sensitivity analysis to evaluate the impact of different peak sales and terminal operating profit, as shown in Exhibit 5. To a degree, the higher peak sales assumptions during this analysis, provide an indication of the potential value of Kind Consumer if it expanded the direct selling of Voke into other European countries. We have analysed the impact of different opportunity cost of capital assumptions on our valuation without the risk adjustment (Exhibit 6). Our non-risk-adjusted valuation with peak sales of £186m and a 12.5% cost of capital is £268m. If Kind Consumer successfully launches Voke as we forecast, we estimate that Kind Consumer could be worth £497m in FY20. 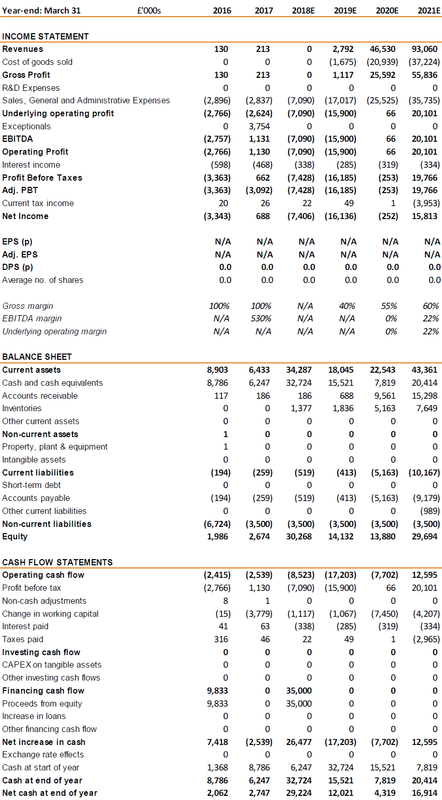 This is based on a DCF valuation of £452m (10% opportunity cost of capital, no risk adjustment), a discounted EV/Sales method of £531m (4x FY23 sales discounted to FY20) and a discounted EV/EBIT approach of £506m (16x FY23 EBIT discounted to FY20). These multiples are in line with current take-out multiples for consumer health companies. It should also be noted that our prospective FY20 valuation excludes any ex-UK sales. It is highly likely that Kind Consumer (or a partner) will be launching or have already sold Voke in other territories, if the UK launch is a success. To provide an indication of what the value of the rest of the European opportunity would be, for example, we estimate that additional European sales of £505m could be generated with penetration at 50% of the forecast UK level in countries outside Eastern Europe. 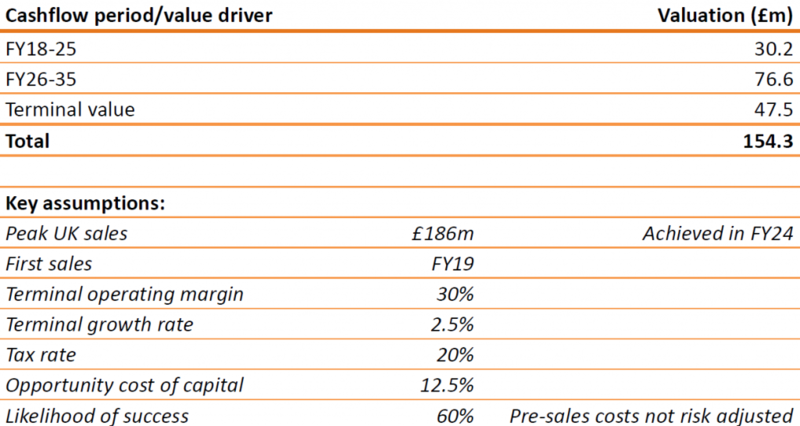 Assuming Kind Consumer used a distributor and only received a 12% royalty on these additional sales (first sales in FY21, opportunity cost of capital of 12.5%; and likelihood of success of 60%), this royalty stream would currently be worth an additional £148m. Our financial forecasts are shown in Exhibit 8. They are based on an aggressive marketing campaign, which should result in the rapid adoption of Voke, given the feedback from comprehensive test marketing initiatives. We forecast that operating expenses will increase from £2.8m in FY17 (March year-end) to £7.1m in FY18 and £17m in FY19. The first sales of Voke are expected in January 2019, which should benefit from the stocking effect, and revenues are subsequently forecast to grow to £46.5m in FY20 and £93.1m in FY21. Our peak sales assumption of £186m for Kind Consumer is based upon 10% of current smokers in the UK buying one Voke packet per week. The Office of National Statistics estimates that 15.8% of the adult population (8m) currently smokes and that on average they smoke 11.5 cigarettes per day (c 4 packets of 20 cigarettes per week). This equates to 33.3bn cigarettes smoked per annum (in comparison the TMA estimates there are 10m smokers with 38bn cigarettes smoked per annum in the UK).We also estimate that the wholesale price of each Voke packet is £4.50, which would allow the retail price to be competitive in comparison to a packet of cigarettes (Retail price of budget brands is about £7.50 per packet and of premium brands is around £10.50 per packet). We estimate that Kind Consumer will be able to achieve a gross margin of 60% with volume and a long term operating margin of 30%. These will depend considerably on the volume of sales and the level of marketing needed to generate those sales. However, we believe we are being conservative given the characteristics of the cigarette market (although technically Voke is an OTC medical device, the pricing structures and consumer profiles and features are closer to the nicotine industry) and note that Philip Morris International achieved an operating margin before excise duty of 78.8% with a gross margin of 87.5% in FY16. Kind Consumer had £6.2m in cash at the end of March 2017 and is currently looking to raise £35m to support the launch of Voke in the UK. This additional capital, we estimate, will cover all of the launch costs in the UK and allow the company to become cash generative. We forecast that Kind Consumer will achieve profitability in of FY20 (March year-end) and become strongly cash generative in subsequent years. Source: Kind Consumer, Trinity Delta Note: Adjusted numbers exclude exceptionals. John Clarke Non-Executive Chairman Extensive experience of the consumer healthcare sector, having worked at GSK for more than 35 years in a variety of marketing and general manager roles. Appointed president of GSK Consumer Healthcare in 2006 and retired in 2011. Also Chairman of Futura Medical (2012), Science in Sport (2013), and Quantum Pharma (2014). Paul Triniman CEO Joined in 2009. Previously CFO at Oxford Nanopore, Oxford Glycosciences, and LSI. Also a Carried Interest Partner at MVM LifeSciences and worked at KPMG. Holds a degree in economics from Bath University and is a chartered accountant (KPMG). Gordon Duncan CFO Joined in 2014. Previously headed Healthcare Investment Banking at Donaldson, Lufkin & Jenrette (DLJ) and Kleinwort Benson (KB), having been on the KB Board since 1990. Also a director in Harwell Oxford. Holds a degree from Bristol University and is a chartered accountant (PWC). Dr Chris Moyses Chief Medical Officer Joined in 2011. Previously CMO of Oxford Glycosciences, VP clinical/regulatory affairs at Amlyn Pharmaceuticals, CEO NeuroDiscovery, R&D director Pharmagene, CMO Argenta Discovery, and also various posts at ICI and GD Searle. Holds a medical doctorate from Cambridge and post-doctorate qualifications from Oxford. Andrew Walker Technical Director Joined in 2017. Previously Head of Device Technology in GSK’s Global Manufacturing & Supply, with responsibilities for Diskus, MistPro, and Ellipta devices. Also at Smith & Nephew. Holds a degree in Mechanical Engineering from Northumbria and further qualifications in Manufacturing Management and Technology.